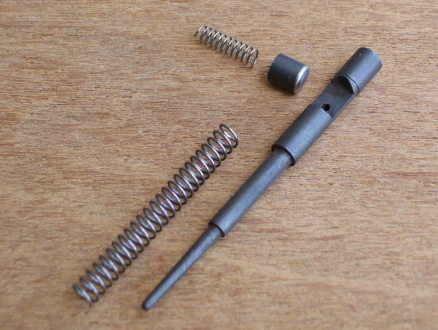 Firing pin, firing pin return spring, firing pin detent, and firing pin detent spring. Similar to the CZ-52-2, but with a much heavier firing pin return spring and corresponding design change in the pin itself. Drastically reduces trigger pull weight and eliminates firing pin tip breakage. Installs in a stock CZ-52 slide in seconds. No modification to factory trigger parts. Click here for installation instructions. Installing the CZ-52-3 may require modifying the extractor on some pistols. The factory extractor may be modified with a flat or circular file, or see our replacement extractors. Some pistols with extremely heavy recoil springs over 16.5 pounds and firing strong hand loaded cartridges may benefit from a heavy firing pin recoil spring.